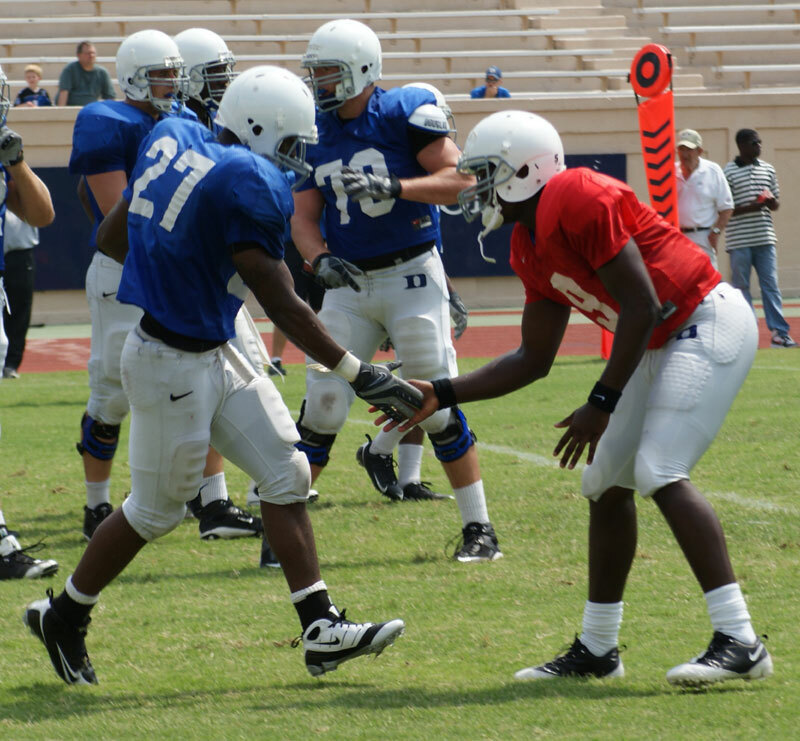 [private]Football season kicks off next Saturday and the excitement around Duke is palpable. 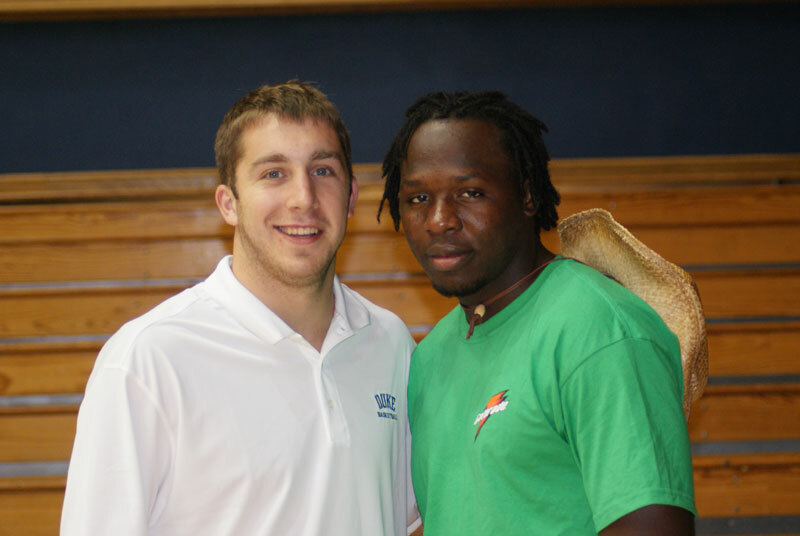 I have some very strong and pleasant memories of Duke football. As a young boy, my father took me to games at Wallace Wade Stadium (some of those games before the horseshoe was renamed) a couple of times a year. Those trips were always a great day so I thought I’d share a couple of memories. Duke hosted South Carolina on September 30, 1967, and the game started fast. My father and I were in our end zone seats with the Duke kick returners lined up right in front of us as South Carolina kicked off to start the game. Duke failed to handle the kick and the ball bounced into the end zone where the Gamecocks covered it for a touchdown. There were only a few seconds gone off the clock and Duke was down by a touchdown. South Carolina went on to win 21-17. Duke may have lost on that particular afternoon, but as an eight year old rabid Duke fan, I still had a great time. In the early days, we always sat in the end zone general admission seats that sold for $1 back in the sixties. On one Saturday afternoon, I don’t remember the year or who was the opposing team, every point scored in the game was scored at the closed end of the stadium right in front of us. Our seats were worth every one of those hundred pennies that day. During the 1974 season, I went to the Purdue game with an older friend who lived across the street. The previous Saturday the Boilermakers had defeated Notre Dame in South Bend. My friend and I had seats on about the 35 - 40 yard line on the East side of the stadium. Duke defeated Purdue 16-14 and as time expired everyone in the stadium was chanting, “We want Notre Dame!” I’m not sure why we wanted the Fighting Irish, they went 10-2 in 1974, but it was exciting at the time. My last trip to Wallace Wade Stadium was almost 32 years ago in 1976. Tony Dorsett and the Pitt Panthers traveled to Durham. Pittsburgh won 44-31 as part of their 12-0 season. But 1976 turned into 1977 and I was off to the United States Navy traveling extensively and living overseas. On yesterday's scrimmage - We did a little game work in yesterday. We had to put that together and make it all work. We followed up today with some walk thru's and corrections and an on the field scouting report continuing with James Madison. We scrimmaged yesterday and we didn't tackle to the ground. We couldn't afford to lose anymore running backs. We got exactly what we wanted out of it ... great looks defensively at what the James Madison offense is suppose to look like. Our number two units ran the James Madison offense. We saw some things in there that give us problems, we saw some things in there we really liked. (Coach asked his team to stay late last evening and study tape). It's always nice when Duke Student Athletes support one another. Just ask Duke quarterback Thaddeus Lewis who recently told BDN, "When you sign on the dotted line to attend Duke University you are embracing a family whether you are a student or student athlete." He went onto say, "I want them (athletes) to support me, so I go out and support them." Lewis could be seen at the Coach K Academy this summer checking out all of the former Duke players while stopping to talk to a couple of current players like Greg Paulus. "I wish I could get out there on the court," said Lewis during that event. He went on to say he played basketball in high school. Almost all athletes at Duke played multiple sports at one time. 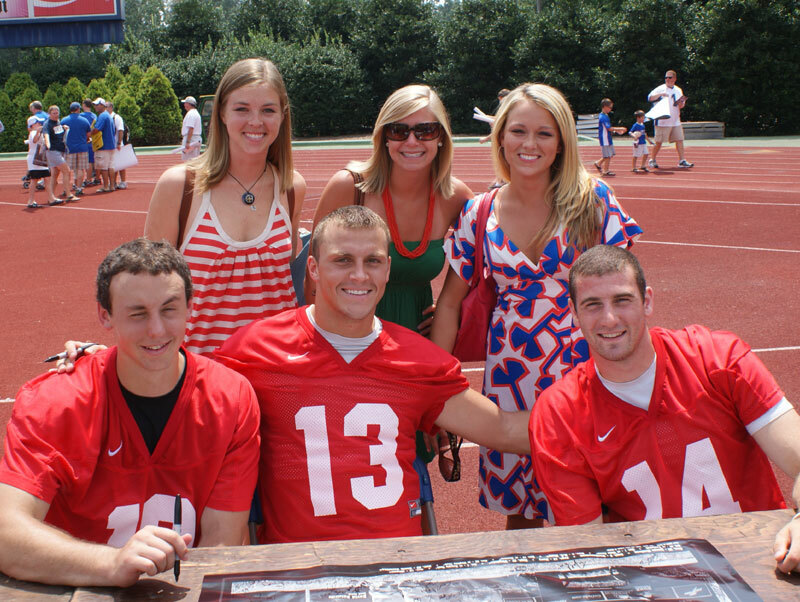 The aforementioned Paulus was one of the top rated quarterbacks in the nation out of high school. In a twist of irony, Paulus could be found at a recent football practice peering on much like Lewis did in Cameron, wondering what if. Lewis and Paulus are two perfect examples of the kind of special athlete Duke produces both on and off the court or field respectively. Both could be seen at various Duke sporting events last year and both are willing to put in the work for their university of choice. I mean, talk about being selfless! Lewis could be field on the field handing out water to prospects during the Duke Football Camps. Paulus could be found atop the hill in the new practice facility waiting to give attendees to the Coach K Academy rides to and from their motel. Just take a second and imagine Lewis handing you a gatorade and Paulus saying "where to," as his van loads. "Greg Paulus is one of the nicest guys you'll ever meet. He'll do anything for his school," said recently retired Frank Dascenzo of the Herald Sun while the two of us sat in the new practice facility during the K Academy. Lewis also supported the basketball Blue Devils at the recent SJC Pro Am event at NC Central University. It's kind of nice when Singler, Williams or Smith can look up and see Duke's starting quaterback in the stands. There is one bond that ties the two together besides being the engine to their respective teams. That being each one is throughly enjoying their Duke experience. "Duke is somewhere you can be comfortable at. It's somewhere where you want to be and it's somewhere where they want you," said Lewis. He went on, "It's family oriented around here and I'm enjoying every mintue of every day. The Blue Devil Nation strives to bring the best coverage available for Duke Football and Basketball. Here is another photo gallery which features the festivities of the Meet the Blue Devils Day (be sure to click Meet the Blue Devils to view the gallery) where fans gathered for autographs from players and coaches. Among the pictures are Coach Cutcliffe's SEC Western Division Champions ring and a more personal look at the new staff. [private] Here is a photo gallery from yesterday's football scrimmage - (View Gallery by going to this LINK and hitting slideshow, just below the picture). 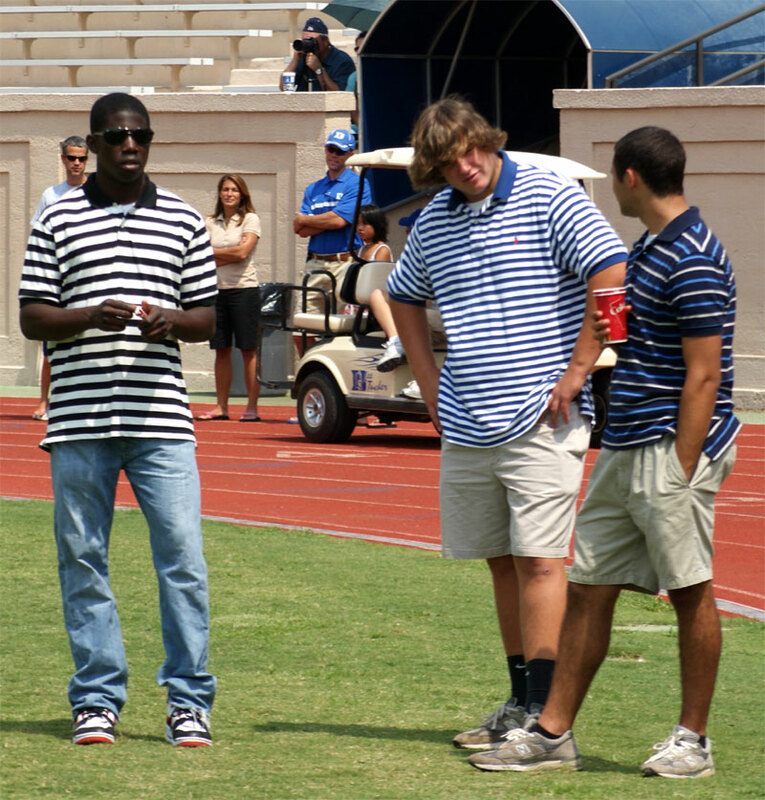 Check back for pictures from the "Meet the Blue Devils" event. 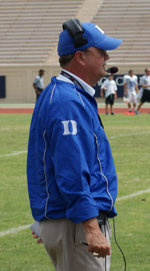 We will also have Coach Cutcliffe's comments after the game with a general recap of the days action. BDN is the place for football coverage, so be sure to check back for almost daily reports leading into the season. True freshman Jay Hollingsworth celebrates his touchdown with quarterback Thaddeus Lewis in the picture to your left.